Flush valves are the heart and soul of any flush system. If you need powerful flush valves, this is your source! WaveFlushTM flush valves are specifically designed to do one job, flush manure as part of a well designed livestock flush system. These are not irrigation valves, they are flush valves. Check out the site, then call to order your valves direct and save. These flush cleaning valves put water to work for you. Designed by Agpro® engineers to effectively release turbulent waters that sweep away manure, bedding and other dairy wastes in just seconds. The resulting slurry can be recycled, stored in ponds, and pumped or hauled for distribution on crop land. These flush valves open almost instantly by the use of a simple lever or an air actuator and close just as fast. This rapid action helps eliminate wasted water and time during opening and closing cycles. The patented design of these flush valves also eliminates "water-hammer" problems. The large size and internal design of these WaveFlushTM valves provides full unimpeded flow with little loss due to friction. Best of all, with the pop-up or grated lids nothing impeeds traffic access. 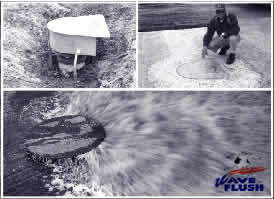 WaveFlushTM flush valves are used in all climates and are adaptable to all environments. They have been used on all types of livestock housing facilities including dairies, beef lots, research, and swine operations. These are the heaviest, best valves available; just compare the weight of our valves to any others and see the difference. Our valves are designed to last many years under demanding continuous use. Go to the specs page to learn more about these flush valves. To get more information on our products or company please contact us. The WaveFlushTM system is used exclusively by Agpro®, the leader in flushing for over 40 years.